Walking into any concert venue, sports arena, or secure government building today, and the first thing you now must do is empty your pockets and walk through a metal detector. Thanks to a rise in mass shootings and terror alert levels, this clumsy and cumbersome process has slowly become the new normal for any entry into a busy place. However, this era of slow security entry may finally be coming to an end, as the future of security could soon merely involve a casual stroll through a gate that safely and swiftly scans waves of people in real time. Meet HEXWAVETM from Liberty Defense Technologies – a brand new threat detection technology developed at MIT that uses real-time Active 3D Image processing to detect metallic and non-metallic threat objects and location, such as a gun, or guns, carried near a school or place of worship prior to the criminal even entering the building. The detection system, can now be as overt as a typical screening gateway, or covert as installing devices into the walls or other hidden fixtures on the way into the venue. “What we’re targeting is the urban security market,” said Bill Riker, CEO of Liberty Defense in an interview with WIRED. 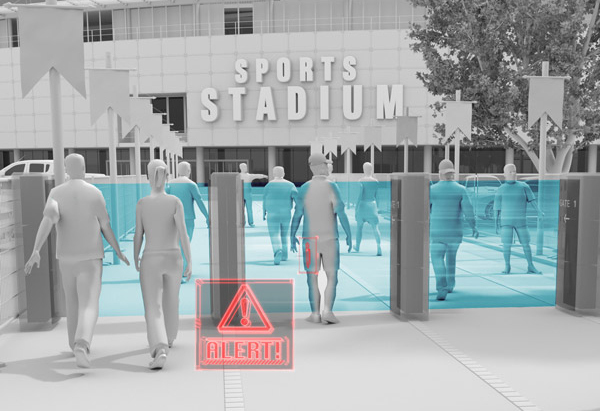 Developed to provide a key part of a layered threat detection defense Liberty Defense is looking beyond airports to other scenarios where people need to be scanned quickly and unobtrusively—such as concerts, sporting events, and large outdoor gatherings. Upon detection, the system can tie into security infrastructure to instantly begin setting off alarms, locking doors and putting people inside on alert to enhance safety in a scenario where every second counts. The Liberty Defense Technologies HEXWAVETM system is the racing to become the security protection of the future—and it couldn’t come soon enough. Since 2015 there have been over 1,700 mass shootings in the USA, with an average of over 350 shootings happening per year. In high-traffic scenarios, dense gatherings of people are soft targets. Currently there are no means to counter threats beyond entry point solutions, which have limitations in terms of a combined criteria for accuracy, throughput and even location around or within the perimeter of a facility. Beyond just sporting events and concerts, places like hotels, schools, and places of worship tend to have a lot of patrons always entering and exiting. A system such as HEXWAVETM might have prevented a scenario such as the Las Vegas shooter successfully bringing a cache of weapons up to his room, veiled under common luggage pieces. HEXWAVETM is designed to discreetly spot metallic and non-metallic objects of interest, such as guns or other weaponry. Tourism in Las Vegas took a noticeable hit in the aftermath of the shooting atrocity. Hotels have been forced to look at new methods to protect their patrons, while refraining from installing obtrusive gate of entry checkpoints that would further add to the feeling of uneasiness left after the horrible event. Where HEXWAVETM aims to help such venues, is to utilize discreet hidden sensors amid entry points, that could perhaps be hidden behind posters, in hotel furniture or in the light fixture—allowing people to be scanned unaware. Through communication from the sensors to central controls, a tripped alarm could alert police or local security officers, while giving its clients instant notification in order to act accordingly, based on the information provided by the scanners. Much of the resistance towards security systems, such as those employed by the TSA in airports and terminals, is directed towards the intrusiveness of their nature. Privacy advocates and civil libertarians have raised concerns about some of the more prominent systems in places such as Dulles International Airport, where facial recognition scanners are in use. “Right now, there is very little federal law that provides any type of protections or limitations with respect to the use of biometrics in general and the use of facial recognition in particular,” said Jeramie D. Scott, national security counsel for the Electronic Privacy Information Center in an interview with the Washington Post. Scott’s organization has filed Freedom of Information Act requests seeking details about the program. Unlike visual recognition technology that is currently in use at many venues, the HEXWAVETM offers a much less intrusive solution. This is achieved by several “game changing” advancements in the technology, which were developed at MIT Lincoln Labs and are exclusive to Liberty Defense Technologies. Due to its unique antenna design and embedded computing power, HEXWAVE’sTM creates 3D images that are virtually analyzed in real time using an artificial intelligence architecture.. The system’s advanced antenna design provides the capability for the sensors to be distributed in a way that is covert. Further, the modular, self-contained design can be deployed across the entry paths of a venue thus enabling it to be scalable to the needs of a responsive security operation. Beyond developing an effective technology, the challenge for stakeholders such as Liberty Defense Technologies is to get their system into as many venues as possible. Key to the company’s future successes are the people behind the scenes. Bill Riker was brought on as CEO in August 2018, after a storied career with Smiths Detection, DRS Technologies, General Dynamics, and the US Department of Defense. COO and President of US Operations, Aman Bhardwaj compliments Riker’s security background, with a tech and manufacturing career that includes over 20 years of experience working with leading global teams for both major and startup companies, including Panasonic, Flextronics/Imerj, Educo and Hisense. Riker and Bhardwaj are joined by a highly-qualified management team of leaders from the security industry, product development, government technology and manufacturing sectors. Assisting the management team is a highly experienced advisory board. Notable among the advisory board is Francesco Aquilini, owner of the Vancouver Canucks NHL hockey team, and the team’s home, Rogers Arena which seats nearly 19,000 people. Aquilini also sits as the team’s main representative on the NHL Board of Governors, among a group that has at least 13 arenas privately owned by members of the board. Aquilini is not the lone sports presence on the advisory board, as current President of Concacaf (the continental soccer governing body in North and Central America) Victor Montagliani is also advising the company. As well, John May, former member of the Live Nation Canada management team, helped grow that event promotion company through to a successful joint venture with Maple Leaf Sports and Entertainment—owners of all the major professional sports teams in Toronto (NBA, NHL, MLB, MLS, CFL). Liberty Defense has an exclusive license with MIT and a Technology Transfer Agreement with MIT Lincoln Laboratory for active millimeter imagining technology originally developed in the MIT Lincoln Laboratory for weapon detection. They are continuing to support the effort through a cooperative research and development agreement for both the commercialization of the design and that includes other development to continue progressing the technology. This capability was developed. in response to the growing threat from terrorism, especially after a wave of subway and train attacks witnessed around the world in places like Madrid and London. Prior to the HEXWAVETM innovation, it was practically impossible to develop security systems with existing technology for busy public spaces without grinding pedestrian traffic to a near halt. The demand is there: According to a Homeland Security Research Corp. study, the global explosives and weapons systems market is projected to be more than $8 billion by 2020 and more than $11 billion by 2025. Liberty Defense Technologies is targeting the urban security which generally consists of 4 vertical markets. The market is segmented into four verticals that include public venues, secured perimeters and buildings, land transportation and a category called “other” that includes everything from schools through places of worship, hospitality fclities and even hospitals. Thesehave been projected to reach $1.5-$2.0B in North America by 2020. Projections for each component include: Public Venues ($283-$428M, CAGR to 8.8%); Secured Perimeters ($820M-$1.03B, CAGR to 4.7%); Land Transportation ($174-$257M, CAGR to 8.2%); Other/Schools/Hotels ($201-$228M, CAGR to 2.7%). In late 2018, Liberty Defense Technologies secured a C$7 million fundraising, in order to commercialize the HEXWAVETM system.